This is the channel that I've been waiting for since the Wii launched, and (of course) it shows up in Japan first. It's called the Minna no Nintendo Channel which translates to Everybody's Nintendo Channel, and from what I've read the channel currently includes videos promoting Wii games, and demos of games for the DS. For DS demos, this channel essentially turns the Wii into a download station. You connect to the Wii with your DS using the download and play option, and download the playable demos. According to destructiod, "the demos only include Namco Bandai's Tamagotchi game, Brain Age 2, and other games in the Touch Generations series." I'm sure this is just a preliminary list, and even then I wouldn't mind trying out Brain Age 2 or Flash Focus. There also appears to be a way to fill out a survey for games that you have played on your Wii. I'm not sure what this will be used for, but it could possibly be useful if Nintendo wanted to use the data to recommend games to you in the future. I would like to see Wii demos added to this list. As I have said in the past, at $50 a pop I can't justify buying a game unless I know I'm going to like it. There are lots of games I want to try and I end up renting them before buying them. I think Nintendo would sell a lot more games if they let people try them before they buy them. They seem to have learned this with regards to the DS, so it makes sense to do it for the Wii as well. Perhaps it's coming and they just haven't put the framework together yet to support Wii demos. There's no word yet on when we can expect this channel in North America, but I hope it's sooner than later. 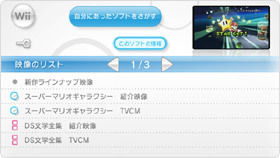 This is the channel that I've been waiting for since the Wii launched, and (of course) it shows up in Japan first. It's called the Minna no Nintendo Channel which translates to Everybody's Nintendo Channel, and from what I've read the channel currently includes videos promoting Wii games, and demos of games for the DS. For DS demos, this channel essentially turns the Wii into a download station. You connect to the Wii with your DS using the download and play option, and download the playable demos. According to destructiod, "the demos only include Namco Bandai's Tamagotchi game, Brain Age 2, and other games in the Touch Generations series." I'm sure this is just a preliminary list, and even then I wouldn't mind trying out Brain Age 2 or Flash Focus. There also appears to be a way to fill out a survey for games that you have played on your Wii. I'm not sure what this will be used for, but it could possibly be useful if Nintendo wanted to use the data to recommend games to you in the future. I would like to see Wii demos added to this list. As I have said in the past, at $50 a pop I can't justify buying a game unless I know I'm going to like it. There are lots of games I want to try and I end up renting them before buying them. I think Nintendo would sell a lot more games if they let people try them before they buy them. They seem to have learned this with regards to the DS, so it makes sense to do it for the Wii as well. Perhaps it's coming and they just haven't put the framework together yet to support Wii demos. There's no word yet on when we can expect this channel in North America, but I hope it's sooner than later.